We’d love your help. Let us know what’s wrong with this preview of Tesseracts 14 by John Robert Colombo. To ask other readers questions about Tesseracts 14, please sign up. Very strange book. "Harvest Moon", "Vermilion Dreams" and "The Short Medical Career of Fine Sam Fine" were the best in the collection. A very wide range of stories and quality. M. L. D. Curelas's Harvest Moon is superb. Her story is chilling and moving. I got very attached to her characters and I'm hoping that she does more in this world, I'd like to see what happens! Her story is a must read. Very enjoyable. My favorite (and I admit that I'm biased) was Harvest Moon by M.L.D. Curelas. However I also liked: Random Access Memory and Flight of Passage. 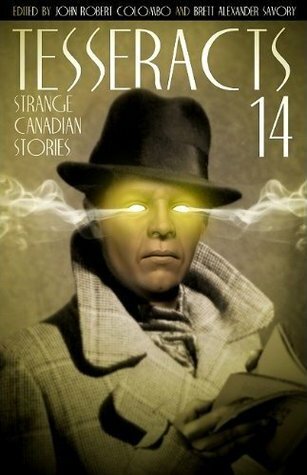 A mixed bag of weird tales and outright horror stories. A third of the stories left me scratching my head, a third were okay, and about 1/3 had me thinking about the stories long after I put down the book. Definitely by it for the 1/3 that were memorable. It's worth it. As usual with short stories, only a few were interesting. Quite a few here were dull, frankly. I only read it for John Park's Nightward, really (it landed squarely in the interesting bucket btw). Heat Death (Patrick Johanneson), Flight of Passage (Jon Martin Watts), and One Nation Under Gods (Jerome Stueart) were also kind of interesting. Also called “Canada’s Mr. Mystery”, Mr. Colombo lives in Toronto with his wife. In addition to writing and running a publishing company, Mr. Colombo has appeared on both television and radio.